The Forbes Four-Star crown of the San Antonio River Walk exudes an oasis of calm. The property has 99 intimate and luxurious guestrooms and suites with 12-foot ceilings and expansive windows that offer views of the river. Accoutrements include marble Jacuzzi baths and four poster beds. Guest services are impeccable with personalized attention to every detail. These services and amenities have afforded the Mokara Hotel and Spa recognition from some of the most acclaimed media in the nation including a place among the Top 15 Hotels in Conde Nast Travelers coveted Best in the World list for two years in a row. The Mokara Spa is the only Forbes Four-Star spa in San Antonio. Its decor reflects a consummate blend of refined elegance and relaxed sophistication. The attention to detail is paramount from the soothing colors and textures of the decor to the attentive eye of the Spa Concierge who provides a seamless transition from a hectic lifestyle to welcome serenity. The on-property high-energy Ostra Restaurant features the freshest seafood and steaks flown in daily from around the world. Our executive chef uses fish that have been raised and harvested in sustainable circumstances in his approach to lifestyle cuisine. Ostra is also known for its tequila menu which features more than 50 varieties of tequilas as well as its extensive collection of vintage wines. Hotel is 100 percent smoke-free. 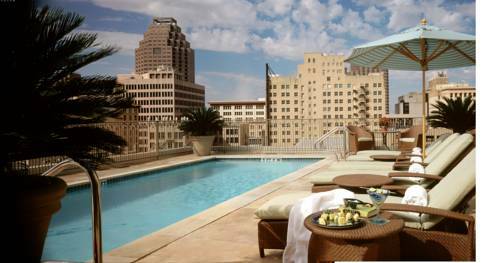 Nestled on the banks of the famed San Antonio River Walk and across from its companion property-the Omni La Mansion del Rio-the Mokara Hotel and Spa introduces a 17000 square foot oasis that redefines spa luxury with its exquisite treatments and stylish decor and highly trained therapists. Healthy Spa-oriented fare featuring salads and paninis. Located on the 8th floor overlooking the city. Limited indoor and outdoor seating. Open Sun-Thur 1100-1500 hours and Fri-Sat 1100-1800 hours. Enjoy exquisite cuisine in a romantic riverfront locale at our signature restaurant which was recently awarded a Wine Spectators Award of Excellence. Open Sun-Thur 0630-2230 hours and Fri-Sat 0630-2300 hours. Features an Oyster Bar which includes a variety of the freshest oysters and clams plus crab and shrimp as well as ceviche. A full wine list and specialty tequilas are also available. Open daily 1130-2300 hours. Spa - Mokara Spa offers - 18 private treatment rooms Private men's and women's sanctuary lounges-Hydrotherapy tub, outdoor Spa poolside cafe with rooftop views of the city. The hotel is in city center. There is public transportation adjacent to property.